Wolves are ferocious, dangerous animals. These animals have 42 deadly teeth and powerful jaws, which they use when hunting together in packs. 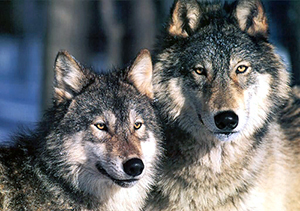 Wolves hunt in groups of up to 20. They wait for their prey to sense danger before they attack. Then, the most powerful wolf, called the alpha, grabs the prey’s nose. The rest of the pack then slows the prey down by biting its backside or ripping the skin off of its neck. The alpha brings the prey down while the other wolves help. Once the prey is killed, however, the wolves do not like to share their catch with one another—it’s every wolf for himself. Though they don’t like to share, wolves still have unique methods of communicating with one another. For example, their tails signal their mood. When a wolf’s tail goes between its legs and touches its belly, it means it is scared. When a wolf places his tail high in the air, it means “back off!”. And if you ever see a wolf with its tail stretched out behind it—watch out! This wolf is ready to attack. Wolves also howl to find other, lost wolves and to scare other packs away. They also speak with each other using whimpers, growls, barks, and squeaks. While they might seem furry and cute, remember that wolves are dangerous animals. If you’re ever near one, beware!